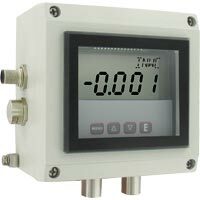 The ISDP Differential Pressure Transmitter provides a 4-20 mA process output, a robust NEMA 4X enclosure, plus a large LCD display that can be programmed to read in pressure, velocity or flow. The ISDP offers simplified programming via a Menu key that enables the user to select: security level; English or Metric engineering units; pressure, velocity or flow operation, K-factor for use with various Pitot tubes and flow sensors, circular or rectangular duct size for volumetric flow operation plus many more. The Series ISDP Differential Pressure Transmitter is powered on its two wire loop with 10-35 VDC via its integral M-12 four pin male connector. The ISDP provides a 0.5% full scale accuracy on ranges from 0.25" w.c. to 100" w.c. as well as bi-directional models up to 10" w.c. These features make the Series ISDP Differential Pressure Transmitter the ideal instrument for monitoring pressures or air flows in hazardous zones having a Class I Div. I Groups A, B, C, D; Class II Div. I Groups E, F, G; Class III Div. I ratings. Accuracy: ±0.5% at 77°F (25°C) including hysteresis and repeatability (after 1 hour warm-up). Pressure Limits: Ranges ≤ 2.5" w.c.: 2 psi; 5" w.c.: 5 psi; 10" w.c.: 5 psi; 25" w.c.: 5 psi; 50" w.c.: 5 psi; 100" w.c.: 9 psi. Temperature Limits: -40 to 160°F (-40 to 71.1°C). Display: 4 digit LCD 0.6" height. Mounting Orientation: Mount unit in horizontal plane. Agency Approvals: FM Intrinsically Safe CLI Div I GR: A, B, C, D; CLII Div I GR: E, F, G; CLIII Div I. CE: CENELEC EN 61326/55024: 2003; IEC 61000-4-2/3/4/6: 2001/2006/2004/2005; CENELEC EN 55011: 2006; 2004/108/EC EMC Directive. A-231 - 16' (5 m) shielded cable with 4 pin female M-12 connection. A-295 - Female four pin M-12 to cable gland connector. A-438 - Surface mounting bracket. Intrinsically safe differential pressure transmitter, range 0-0.25" w.c. Intrinsically safe differential pressure transmitter, range 0-1" w.c. Intrinsically safe differential pressure transmitter, range 0-10" w.c. Intrinsically safe differential pressure transmitter, range 0-25" w.c. Intrinsically safe differential pressure transmitter, range 0-50" w.c. Intrinsically safe differential pressure transmitter, range 0-100" w.c. Intrinsically safe differential pressure transmitter, range -0.25/+0.25" w.c. Intrinsically safe differential pressure transmitter, range -1.0/+1.0" w.c. Intrinsically safe differential pressure transmitter, range -2.5/+2.5" w.c. Intrinsically safe differential pressure transmitter, range -5.0/+5.0" w.c. Intrinsically safe differential pressure transmitter, range -10/+10" w.c.